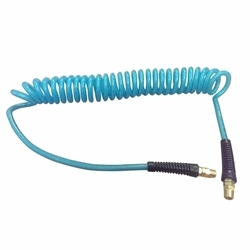 Interstate Pneumatics HR74-010 Recoil Braided Polyurethane Hose with 1/4 Inch Swivel Fittings. 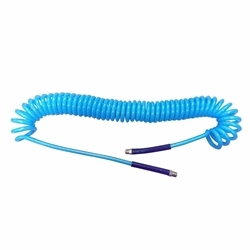 Interstate Pneumatics Polyurethane Recoil Hoses are made from a special super tough Polyurethane compound for consistent performance. These hoses provides you with the highest quality and the most extensive offering of recoil hose in the industry. Finest polyurethane material is used which provides maximum resistance to oil, grease and abrasion. Their low weight in comparison to regular PVC and rubber hoses makes them a favorite for all industrial and automotive applications. We have in-stock numerous sizes; lengths and colors. Our recoil air hoses come standard with ¼” swivel male National Pipe Threads (NPT) end connections on both ends. The swivel ends are perfect in preventing kinks when attaching an air-powered tool.The recoil air hose comes standard with 8” long end on one end and a 15” long end on the end to keep the tool away from the coil of the hose. Our Polyurethane recoil hoses has good for abrasion resistance, ultraviolet (UV) radiation, oil, electrical, and chemical resistance. The polyurethane construction also resists weather, ozone, and heat damage, doesn't cause marring to sensitive surfaces, and weighs less than hoses made of other materials. This recoil air hose is suitable for industrial, contractor, or household use with air compressors, nailers, sprayers, and staple guns, among other pneumatic tools. Automatically retract when not in use, which eliminates the hazards caused by loose hoses on the work floor. 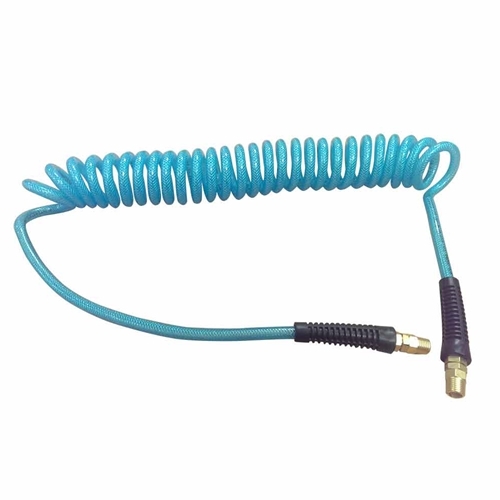 Interstate Pneumatics HR74-015 Recoil Braided Polyurethane Hose with 1/4 Inch Swivel Fittings. Interstate Pneumatics Polyurethane Recoil Hoses are made from a special super tough Polyurethane compound for consistent performance. These hoses provides you with the highest quality and the most extensive offering of recoil hose in the industry. Finest polyurethane material is used which provides maximum resistance to oil, grease and abrasion. Their low weight in comparison to regular PVC and rubber hoses makes them a favorite for all industrial and automotive applications. We have in-stock numerous sizes; lengths and colors. Our recoil air hoses come standard with ¼” swivel male National Pipe Threads (NPT) end connections on both ends. The swivel ends are perfect in preventing kinks when attaching an air-powered tool.The recoil air hose comes standard with 8” long end on one end and a 15” long end on the end to keep the tool away from the coil of the hose. 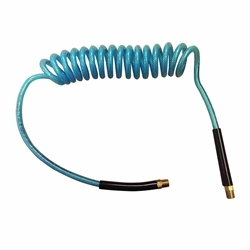 Our Polyurethane recoil hoses has good for abrasion resistance, ultraviolet (UV) radiation, oil, electrical, and chemical resistance. The polyurethane construction also resists weather, ozone, and heat damage, doesn't cause marring to sensitive surfaces, and weighs less than hoses made of other materials. This recoil air hose is suitable for industrial, contractor, or household use with air compressors, nailers, sprayers, and staple guns, among other pneumatic tools. Interstate Pneumatics HR74-025 Recoil Braided Polyurethane Hose with 1/4 Inch Swivel Fittings. 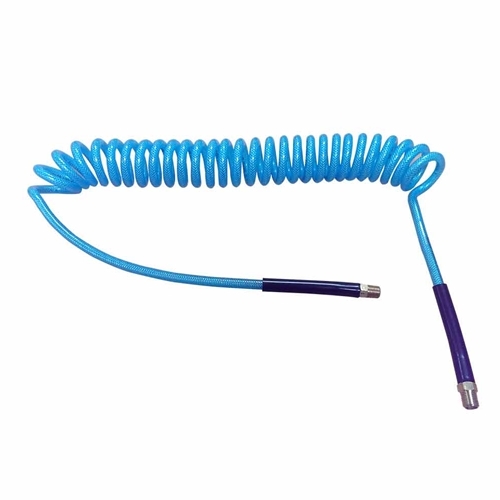 Interstate Pneumatics Polyurethane Recoil Hoses are made from a special super tough Polyurethane compound for consistent performance. These hoses provides you with the highest quality and the most extensive offering of recoil hose in the industry. Finest polyurethane material is used which provides maximum resistance to oil, grease and abrasion. Their low weight in comparison to regular PVC and rubber hoses makes them a favorite for all industrial and automotive applications. We have in-stock numerous sizes; lengths and colors. Our recoil air hoses come standard with ¼” swivel male National Pipe Threads (NPT) end connections on both ends. 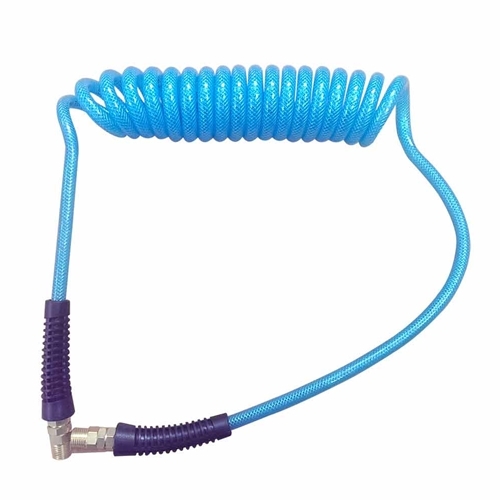 The swivel ends are perfect in preventing kinks when attaching an air-powered tool.The recoil air hose comes standard with 8” long end on one end and a 15” long end on the end to keep the tool away from the coil of the hose. 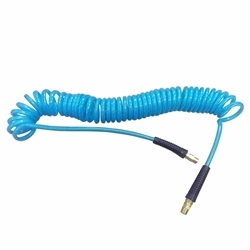 Our Polyurethane recoil hoses has good for abrasion resistance, ultraviolet (UV) radiation, oil, electrical, and chemical resistance. The polyurethane construction also resists weather, ozone, and heat damage, doesn't cause marring to sensitive surfaces, and weighs less than hoses made of other materials. This recoil air hose is suitable for industrial, contractor, or household use with air compressors, nailers, sprayers, and staple guns, among other pneumatic tools. 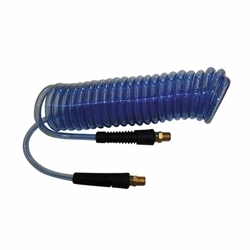 Interstate Pneumatics HR74-050 Recoil Braided Polyurethane Hose with 1/4 Inch Swivel Fittings. Interstate Pneumatics Polyurethane Recoil Hoses are made from a special super tough Polyurethane compound for consistent performance. These hoses provides you with the highest quality and the most extensive offering of recoil hose in the industry. Finest polyurethane material is used which provides maximum resistance to oil, grease and abrasion. Their low weight in comparison to regular PVC and rubber hoses makes them a favorite for all industrial and automotive applications. We have in-stock numerous sizes; lengths and colors. Our recoil air hoses come standard with ¼” swivel male National Pipe Threads (NPT) end connections on both ends. The swivel ends are perfect in preventing kinks when attaching an air-powered tool.The recoil air hose comes standard with 8” long end on one end and a 15” long end on the end to keep the tool away from the coil of the hose. Our Polyurethane recoil hoses has good for abrasion resistance, ultraviolet (UV) radiation, oil, electrical, and chemical resistance. The polyurethane construction also resists weather, ozone, and heat damage, doesn't cause marring to sensitive surfaces, and weighs less than hoses made of other materials. This recoil air hose is suitable for industrial, contractor, or household use with air compressors, nailers, sprayers, and staple guns, among other pneumatic tools. 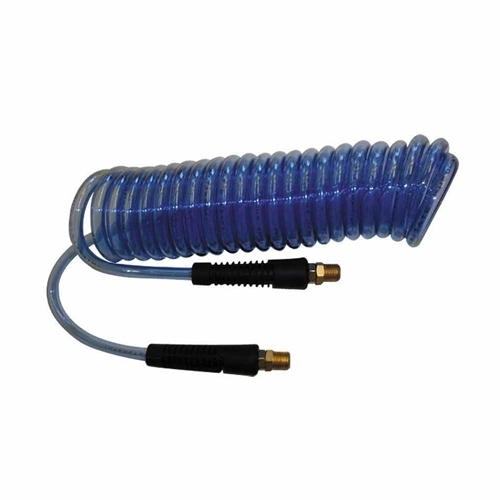 Interstate Pneumatics HR26-020A Recoil translucent blue Polyurethane Hose with 1/4 Inch Swivel Fittings. Interstate Pneumatics Polyurethane Recoil Hoses are made from a special super tough Polyurethane compound for consistent performance. These hoses provides you with the highest quality and the most extensive offering of recoil hose in the industry. Finest polyurethane material is used which provides maximum resistance to oil, grease and abrasion. Their low weight in comparison to regular PVC and rubber hoses makes them a favorite for all industrial and automotive applications. We have in-stock numerous sizes; lengths and colors. Our recoil air hoses come standard with ¼” swivel male National Pipe Threads (NPT) end connections on both ends. The swivel ends are perfect in preventing kinks when attaching an air-powered tool.The recoil air hose comes standard with 8” long end on one end and a 15” long end on the end to keep the tool away from the coil of the hose. Our Polyurethane recoil hoses has good for abrasion resistance, ultraviolet (UV) radiation, oil, electrical, and chemical resistance. The polyurethane construction also resists weather, ozone, and heat damage, doesn't cause marring to sensitive surfaces, and weighs less than hoses made of other materials. This recoil air hose is suitable for industrial, contractor, or household use with air compressors, nailers, sprayers, and staple guns, among other pneumatic tools.